Iconic photographer Robert Capa loved Champagne so much so it supposedly inspired the name behind of the world's most famous picture agencies, Magnum. 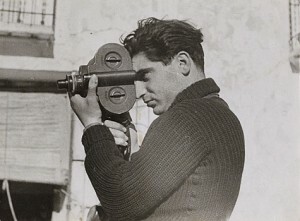 Capa co-founded Magnum with Henri Cartier Bresson, amongst others, in 1947. 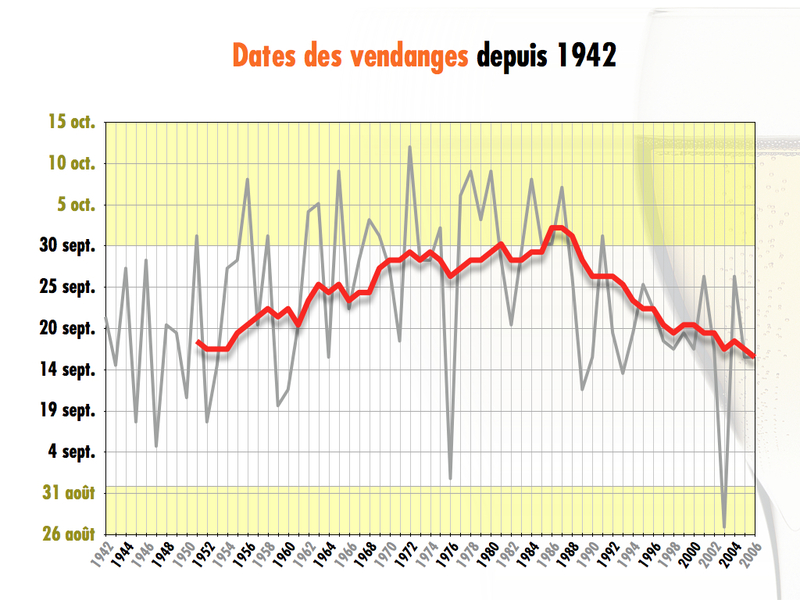 1947 was not only of the finest Champagne vintages but the late 1940s marked the start of a period of cooler temperatures in the region which were not reversed until the late 1980s. "Our archives covering harvests over the past 60 years show that since 1995 Champagne has returned to maturity levels which are, on average, in excess of 10 natural degrees of alcohol, with acidity levels around 7 to 8g/l. Theses levels are close to those traditionally seen for great vintages including 1945, 1947 and 1959, but today's yields are sometimes three to four times higher." 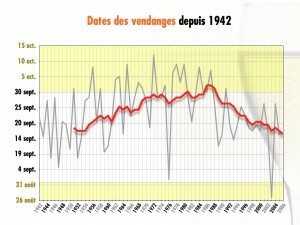 Harvest dates in the vineyards of Champagne are of the indicators used by the Observatoire National sur les Effets Réchauffement Climatique to measure climate change generally. Since 1989 (the end of a cool temperature cycle) harvest dates have crawled gradually backwards and the 2007 harvest started on August 20. By comparison, in 1945, the harvest commenced on September 8 and the 1947 harvest started on September 2, whilst harvests in the late 1980s were in early October. Roederer have already implemented some new techniques to obtain fresher wines as the raw material becomes riper. So, for , in their wine-making they carefully manage the malo-lactic fermentation sometimes doing only partial MLF or halting it altogether. This helps to maintain the acidity and freshness. Secondly, they control the dosage "which has changed a lot in the last 10 years". Extrapolating to what might happen in the next 10-30 years time is “the question. But we work on that too on a trial basis." Roederer own 215 hectares of vineyards in the Appellation, of the largest holdings. These supply two-thirds of their grape requirements. Lecaillon explains: "We have completely changed our soil management during the last 10 years. We have converted most of our vineyards to more traditional tilling and ploughing whilst sowing some control weed to the vine root system deeper into the soil. This helps the plant find water and moves them away from the top of the soil. If the roots are very deep they are less affected either by too much or a lack of water. 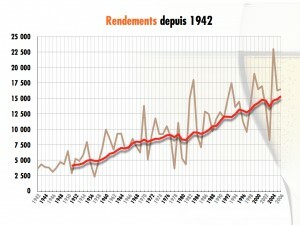 Today some 25% of the vineyards are converted, another 50% more will be converted by 2012." "We have fantastic tool at Roederer: all our Pinot Noir, two-thirds of our acreage, is massale selection. We don't employ clonal selection. We have five conservatories ( or collections) in the vineyards where we keep our Pinot Noir individuals which we have followed for a hundred years. Within this biodiversity we believe that there are some solutions to the new conditions. As an : in the same block of old vines, 2 vines next to each other can produce harvest dates which are equivalent to a difference of 3 weeks in ripening. In warmer conditions in the future we will look for individuals which have a different maturing cycle." The CIVC have amassed some considerable statistics which demonstrate how the climate might change in the next 20-30 years based on changes which they have monitored have which have occurred over the last 20 years. On average, yields have gone up by 50% in the last 20 years. ( 1). The weight of the grapes have gone up. This is entirely due to climate change. Harvest dates are now more precocious too by up to 15 days ( 6). 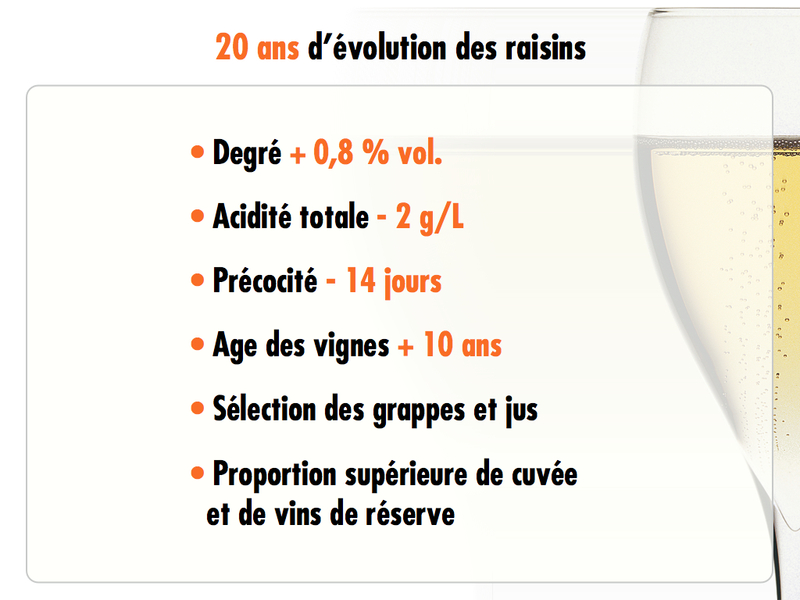 Older vines (older than 30 years), with their qualitative influence, are now in the majority ( 7). Vignerons usually uproot vines when yields decrease, as they older. Now there is no need. 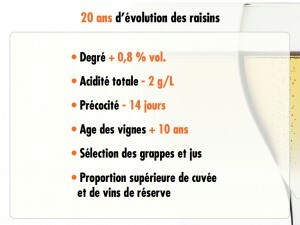 Increased yields mean that more wine-makers only use the 'cuvée' (first pressing) and not the taille (second pressing). 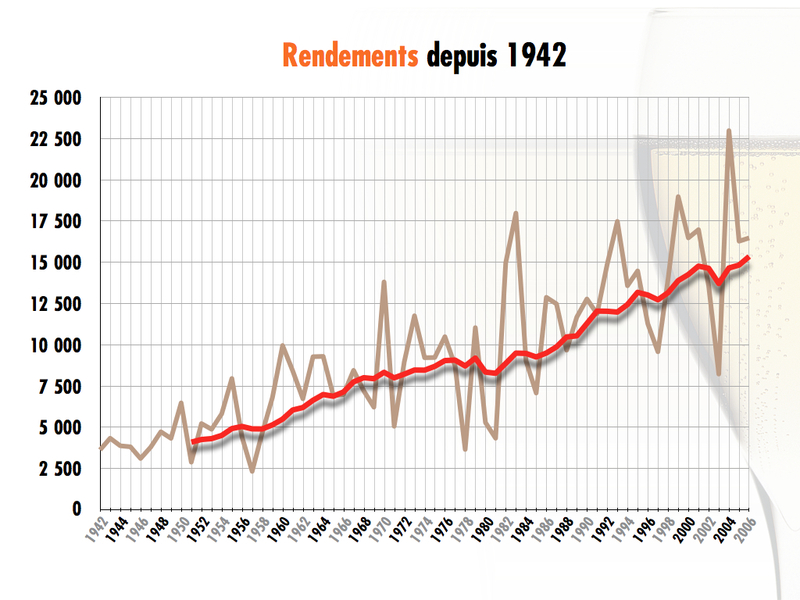 Despite increased yields the Champenois now use 50% less pesticide than previously. This demonstrates that this is a natural and not artificial phenomenon and it has a beneficial impact on a domain's finances. The changes wrought by an altered environment have, so far, been very favourable for yields and the quality of Champagne produced. Champagne are a major beneficiary because they have no shortage of water which is a major disadvantage to other wine-producing regions. A shortage of water early on in maturation ratchets everything up. But if there is water (and light/heat) then the vines keep working producing higher yields. This is helped because there is less frost than there used to be. These are better conditions for white wine making, albeit water stress towards the end of the cycle can help. 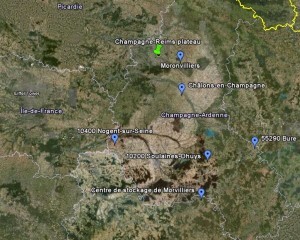 There is plenty of evidence to suggest that the water levels in Champagne will not change dramatically in the future. Rainfall has remained the same over the last 20 years. if it increased the topology of the vineyards ensures good drainage. A drought is very unlikely because of the volume of water contained in the chalky soils. This was true during the heatwave of 2003. Some varieties may be more affected than others. There is no doubt that Pinot Noir likes heat more than Pinot Meunier and may adapt better. Chardonnay too enjoys the heat. But nocturnal temperatures are a key element and these have remain unchanged, especially during the important month preceding the harvest. A degree rise in temperature has not altered the product and, so far, little modification has been required. A further rise of the same order will not, the Champenois believe, alter their products' characteristics. Research on vines is slow. But wine producers know that they can intervene both in the vineyard or in the cellar as required. They can keep the same varieties whilst altering the clones. They can change the trellising - going higher – and alter the density of the plants. They can position the grapes in shade rather than in the sun. They can adjust their pruning techniques. They can bring the harvest date forward. In vinification they can, of course, add acidity and control the fermentation to halt MLF. Most still do not do this but it is likely that in the next 30 years most will. Barring any catastrophe, the outlook for Champagne is looking very positive. Successive governments in France have long been advocates for a nuclear development programme which now results in the country producing about 80% of its electricity from nuclear fuels. The corollary of this is not only a proliferation in nuclear plants (59) but sites for storing the waste products from this process (some 1,000). If superimposes sites run by Andra (Agence Nationale pour la Gestion Des Déchets Radioactifs) and EDF (Electricité de France) onto a map, they effectively ring the whole Champagne Appellation - Soulaines-Dhuys (waste depot), Morvilliers (waste depot), Nogent-sur-Seine (nuclear plant), Moronvilliers (study centre), Bure (research laboratory and a project for a signifcant new waste disposal deposit), and Châlons-en-Champagne (office of l'Autorité de sûreté nucléaire - ASN ). Unfortunately for the Champenois (because irrespective of one's point of view the nuclear debate is very polarising and where the 'nimby' view prevails), it is precisely its geological profile which has excited the interest of Andra. Not that wine-makers are that keen on alternatives such as wind farms. Jean-Baptiste Lecaillon of Champagne Louis Roederer is as much afraid of wind farms as he is of nuclear waste producing, he feels, a diverse range of unwanted side-effects: vibrations, magnetic fields, and having a negative impact on birds and wildlife.